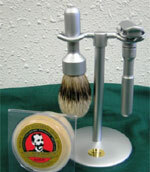 Cool Shaving has merkur vision shaving razors, straight edge razors, safety razors, shaving brushes, strops, stones, shaving mugs and shave soaps for a great close wet shave. 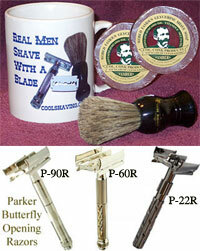 We carry both Colonel Ichabod Conk Shaving Products and Parker butterfly saftey shaving razors. 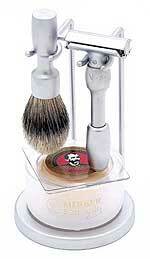 For the Coolest, Closest, Most Comfortable wet shave ever! Conk soaps are incredibly soothing for your face -- a dove bar for your face; old-fashioned safety and straight edge razors, using the world's best badger and boar hair brushes that give your face THE most refreshing close shave. 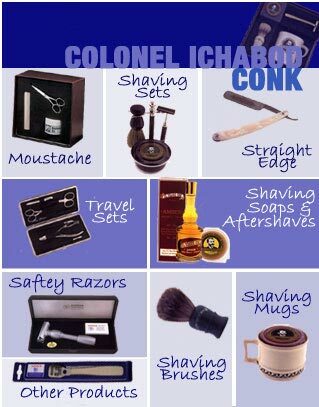 We have wet shaving supplies, sharpening stones, strops, shaving gift sets, travel sets, shaving mugs, moustache and personal care products such as manicure sets, nail clippers and MERKUR corn and callous removers. 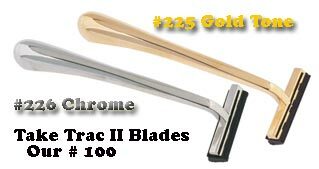 Our # 225 , 226, 200 and 205 shavings razors take the Gillette Trac II blades or our # 100 double trac blade. 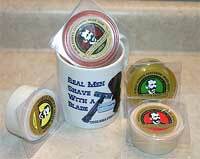 FREE SHIPPING ON ORDERS OVER $30.00 SHIPPED IN THE USA - Call 803-755-1141 to check stock for rush gift purchases. Next day and second day UPS available. 9-4 weekdays Eastern Time. 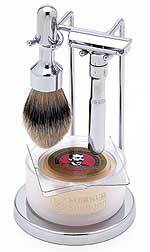 Butterfly Opening Safety Razor Best Value Gift Offer - Shaving Mug, 2 soaps Badger shaving brush and your choice of 3 Parker safety shaving Razors. Subscribe to our new product notifications to receive emails when new products are released. Your email is not shared with anyone else. Secure on-line or toll free ordering or use our mail-in form with shipping tables. SHAVING EXPERT RECOMMENDS THE PRODUCTS COOLSHAVING CARRIES! Weekend Today TV Show featured a shaving expert who reported the current boom in traditional wet-shaving products and techniques. 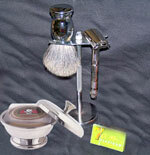 This expert said men were tired of the poor shave which TV-advertised blades were giving them. 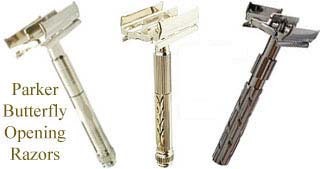 In the course of speaking of shaving razors, brushes, and wet shaving materials, this shaving expert recommends many of the products Coolshaving currently carries. 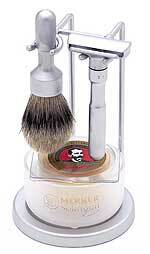 Shavings Razors that take the Gillette Trac II blades or Our # 100 double trac blade.